Ballymena Runners invaded Glasgow at the weekend for the Great Scottish Run ... but the club colours were also spotted in places as diverse and far apart as Florida and Downpatrick! The club made their annual sojourn to Glasgow at the weekend to take part in the Great Scottish Run Half Marathon and 10k events. Pamela Kane finished her 13th Half of the season in an impressive 1:49:08, ahead of Geoffrey McClean (1:59:08) and Roy White (2:02:41) - indeed, this was Roy's 140th Half Marathon and also his last, although this great ambassador for the club will continue to run. Sinead and Elaine Scullion also took on the 13.1 mile challenge in difficult conditions through the city. In the 10k, Garry Steele led the Ballymena contingent in a time of 48:46, ahead of Jane Banks (53:29) and Catherine Stewart (56:64). Also running in club colours were Aidy Dodds, Norman Stephens, Sharon Stephens, Margaret McAleese, Maria McKeown, Stephen Brown, Elizabeth Brown, Grace Snoddy, Kim Close, Cara Johnston and Catherine O'Melvena. Well done to everyone, a great time was had by all. Here's to next year! The latest race in the Novosco Grand Prix 10k series took place in Bangor on Saturday morning with Ballymena Runners well represented amongst the 1000 strong field. Run over an undulating course on what was a hot day Ben Morrow led the local charge, coming 19th overall in a chip time of 35:21, just ahead of club mates Noel Connor (36:33) and James Turtle (37:33). First lady was Linda Petticrew (46:24) with Alison Foster (51:48) and Rebekah Crilly (56:34) occupying the rest of the top three from the club. Also representing the club were Parveen Akhtar, Billy Bamber, Conor Crilly, Rodney Livingstone, David Nicholson and Brigid Quinn (age category winner). On Sunday the inaugural Run-Anon Lough View 10k & 5k event was held on the shores of Lough Neagh. Starting at Crumlin Glen and ending at St. Joseph's School, the course was undulating and included views of the lough at various points. 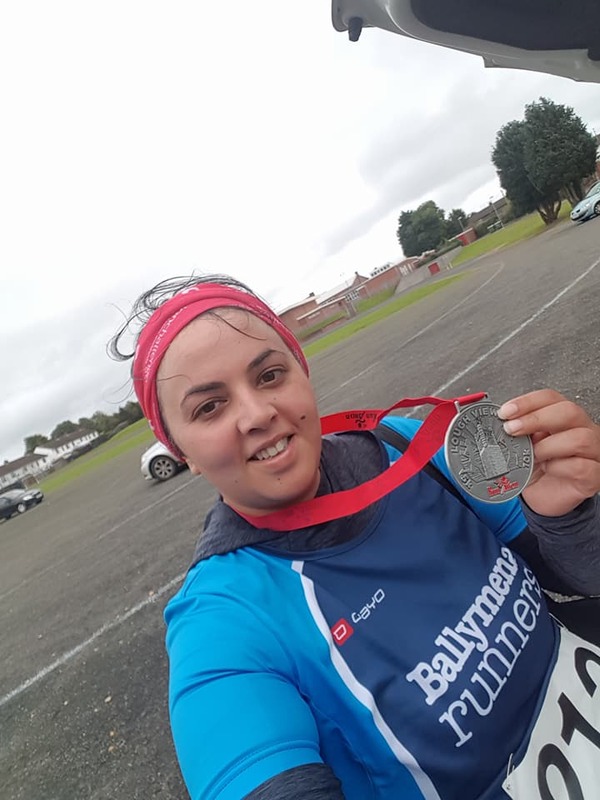 Two Ballymena Runners competed, Rosie O'Mahony and Parveen Akhtar. Congratulations to Rosie for an age category win while, for Parveen, it was her second race in as many days after competing in the Bangor 10k 24 hours earlier! The Ballymena Runners shirt is often seen far and wide across the globe, and this week was no different as Chris Young and Grace McGonigle donned club colours as they lined up for the Clermont Waterfront parkrun in Florida. A simple out and back course along the shores of Lake Mineola, both performed superbly in the heat and humidity with Chris finishing in ninth spot overall while Grace was first lady in her age category. We run the world! Congratulations to Jason Wilson on clocking up his third successive victory at Portrush parkrun on Saturday, crossing the line ahead of the pack in 17:51 and setting a new PB in the process! There was something a little bit different for Kelly Courtney at the weekend when she competed in the latest Waggy Races 5k in Finnebrogue Woods near Downpatrick alongside four-legged buddy Daisy, herself no stranger to Ecos parkrun on a Saturday morning. Waggy Races is a relatively new series of events which sees dogs and their owners take on the most scenic of cross country routes that Northern Ireland has to offer. Finnebrogue was the tenth event to date with previous locations including Portstewart Strand, Tollymore Forest, Murlough Bay and Castle Ward. Well done Kelly and Daisy! Aidy taking time out for his fans in Scotland!